Results of the 2015 InFORM biotic monitoring program with updated results (larger, bold italics) where individual fish samples were reanalyzed to determine the presence of the Fukushima fingerprint isotope, 134-Cs. For the first time, the Fukushima fingerprint isotope, cesium-134 (134Cs; half-life ~ 2 years), has been detected at an extremely low level in a Canadian salmon by the InFORM project. The single sockeye salmon that tested positive was sampled from Osoyoos Lake in the summer of 2015, according to scientists from the Radiation Protection Bureau at Health Canada, in cooperation with Fisheries and Oceans Canada and local First Nations. The sample was one of a few (8 out of 156 total) individual fish that had trace levels of the longer lived cesium-137 (137Cs) (30 yr half-life) that we reported on last winter. To determine if this trace 137Cs was from Fukushima or remnant from atmospheric weapons testing, InFORM reexamined these individual fish samples to see if extremely low levels of 134Cs may be present. The results of this extended analysis show that trace (0.07 Bq kg-1) levels of 134Cs were detected in one sample from Okanagan/Columbia River population. No 134Cs was detectable in the other samples. The observed levels remain well below the action level (1000 Bq kg-1) set by Health Canada guidelines. As we reported in the winter 2016 update, 8 individual fish (out of the 156 measured) from 2015 tested positive for low levels (<1 Bq kg-1) of cesium-137 (137Cs). 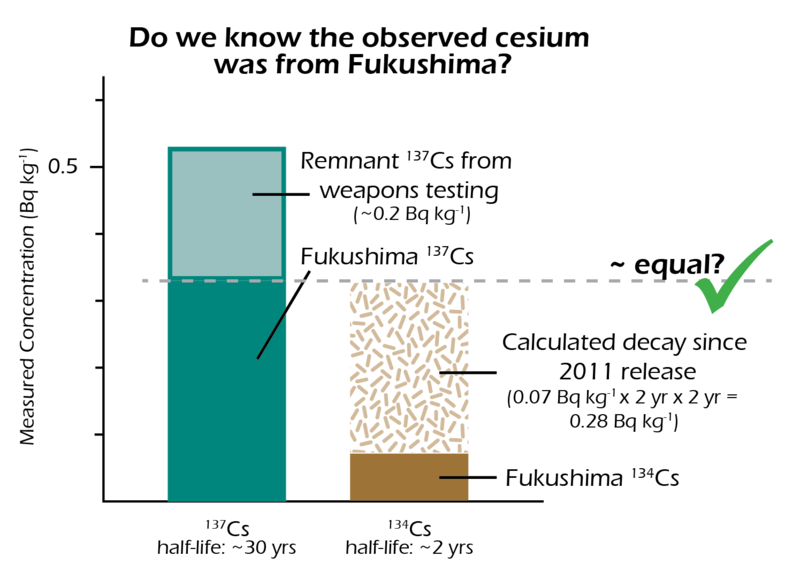 With its ~30 year half-life, 137Cs is still present in the environment from 20th century atmospheric weapons testing and Chernobyl in addition to the Fukushima accident. In contrast, no individual fish from the 2014 monitoring effort were found to contain detectable levels of 137Cs. This difference led the team at the Radiation Protection Bureau to conduct a more detailed investigation of some of those few positive samples to determine if 134Cs, the Fukushima fingerprint isotope, was present. Results from 5 of those 8 are now available and discussed below. The remaining three samples have now been processed, and no elevated levels of 137Cs or 134Cs. 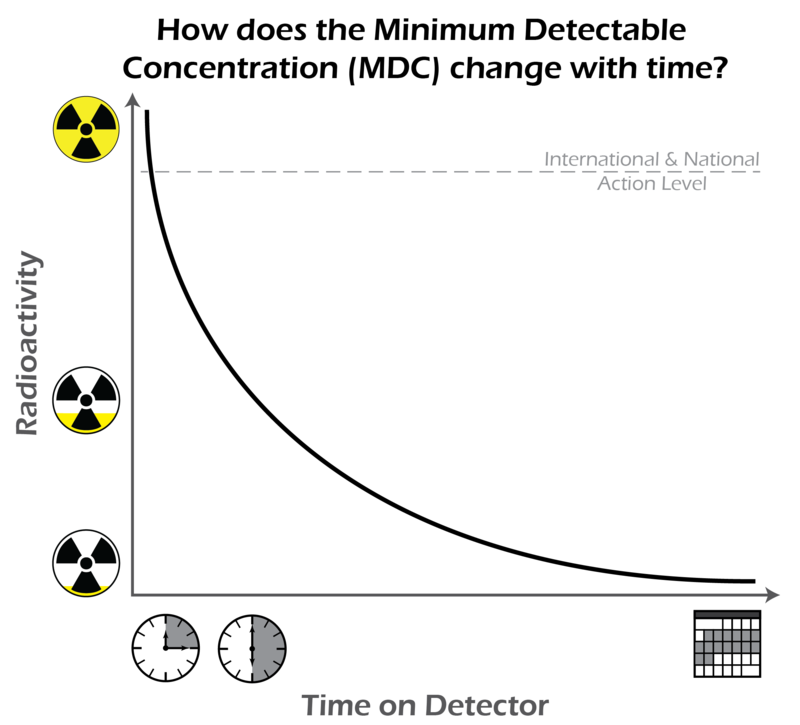 While only short times on the detector are needed for rather contaminated samples, a longer duration in the detector lowers the Minimum Detectable Concentration (MDC) and improves the statistics necessary to resolve lower levels of contamination. A more detailed investigation requires that the minimum detectable concentration (MDC) be lowered. When studying ionizing radiation, the MDC is a threshold that refers to the statistics of detecting individual nuclear disintegrations after a sample has been on a detector for a period of time. With each additional disintegration detected, the signal becomes more distinct from the noise. When detecting trace concentrations of isotopes, disintegrations are infrequent and thus more time on the gamma spectrometer detector is necessary to lower the MDC and determine with confidence (signal clearly, and statistically, above the noise) that an isotope is present. 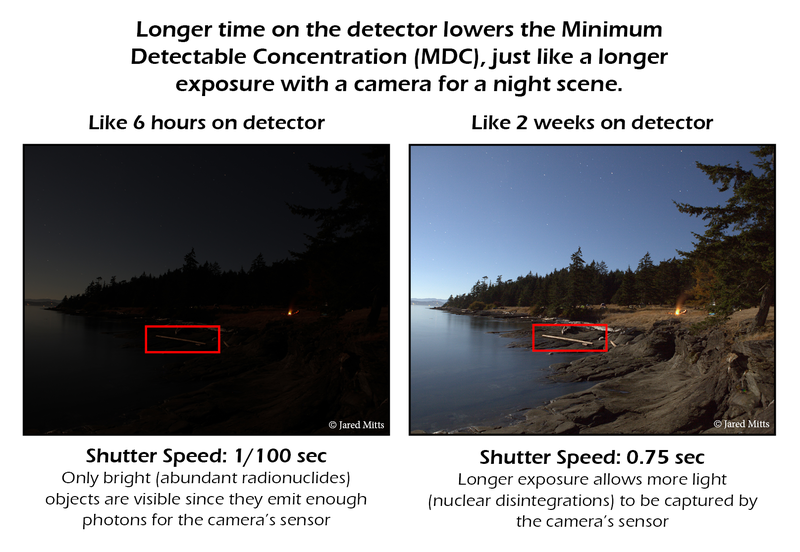 Lowering the MDC is analogous to increasing the exposure time for a camera to capture a good night scene as shown below. Additional time on the gamma spectrometer detector provides us with a clearer picture of the radionuclides present in the sample. For these salmon samples, each was freeze dried, to prevent the meat from going rancid, then placed on the detector for a full two weeks (336 hours). For comparison, InFORM salmon samples are normally counted for 6 hours. Similar to the photos above, after 6 hours on the detector, you can just make out the scene of a campfire on the beach, but it is difficult. In the case of those 8 samples, it was even possible to see that something was present, as with the logs on the shoreline in the photo (red square), but there is not enough signal to clearly resolve what that item might be. When placed on the detector for 2 weeks the decay signal is improved and the MDC threshold is lowered, similar to increasing the length of the camera’s shutter speed to capture more light. Results from five of those eight positive samples from 2015 are now available as seen above. You can see that after the 6 hour detection run, none of these samples measured at levels higher than the MDC. As in the camera analogy, this would indicate that the resolution, or statistics, is not resolved enough to determine the real concentration. Thus, the further investigation with each sample on the detector for a 2 week duration lowers the MDC, improves the statistics, and provides a much clearer picture of the radionuclide concentrations in these samples. With the lower MDC, the results are more statistically robust. In the graph above we see the 2 week results (darker teal and brown vertical bars) are now above the associated MDCs (horizontal lines) so we have greater confidence in the signal. In four of the five samples reporting, those early indications of of 137Cs in the sample turned out to be cases that weren’t statistically significant and the longer analysis revealed that levels of 137Cs decreased and the new results were in agreement with the average value for all the 2015 samples. This result is not totally surprising and is a good example of statistical regression to the mean. However, one of the samples from Osoyoos Lake confirmed the level of 137Cs (0.53 Bq kg-1) and showed a very low (0.07 Bq kg-1), signal for 134Cs, the Fukushima fingerprint isotope. Validating the ratio of 137-Cs to 134-Cs to verify the Fukushima source. We can validate that the observed signal comes from Fukushima by comparing the observed levels of 134Cs and 137Cs. The salmon sample was collected in 2015, almost exactly 2 half-lives of 134Cs (t1/2 = 2.06 years), or 4 years, after the majority of this radioisotope was released into the environment. If we decay correct the 134Cs in the sample to the time of the Fukushima disaster in 2011, we get 0.35 Bq kg-1. We know from previous work by other scientists that 134Cs and 137Cs were released from the Fukushima accident in equal amounts. This should mean that the level of 137Cs in the sockeye sample is approximately equal, so what is the source of the additional 0.2 Bq kg-1? Examining the results of the 155 other salmon collected in 2015 we see from the sum of their spectra that the average concentration of 137Cs in all of these fish was ~0.2 Bq kg-1. Since no Fukushima radiation was detected in any of those samples we deduce that this is the level of contamination attributable to historic atmospheric weapons testing. Therefore, we conclude that just over half of the observed levels of radiocesium in this sample are from Fukushima contamination with the rest being from historical sources of human contamination in the 20th century. 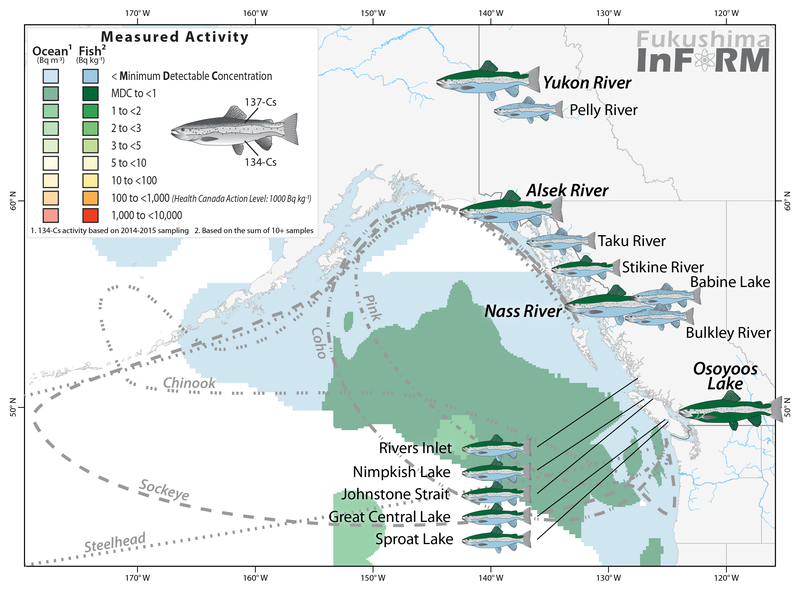 The InFORM team stresses that even though the results presented confirm Fukushima radiation in this Pacific salmon, the levels of contamination do not approach levels that represent a significant health threat to the fish or to a human consumer. Based on this measurement, the total cesium (137Cs + 134Cs) radioactivity in this sample is 0.60 Bq kg-1, which is over 1000x lower than the level of concern according to Health Canada. For perspective, you would need to consume 1000-1500 kg of salmon with this level of contamination in a short period of time to increase your radiation dose by the same amount as a single 5 hour cross-country flight. To view the full results from all 156 salmon from 2015 that were analyzed as part of our Fukushima biotic monitoring effort see our earlier summary or Open Data Canada. Initial results from the 2016 biotic monitoring program will be available shortly. Updated 1 Mar 2017: Correction was made to the source location of the salmon that tested positive. The fish was caught in Osoyoos Lake and is known to spawn in the Okanagan River. The fish was not from Okanagan Lake, as previously reported..
Okanagan Lake? Unsure that Sockeye Salmon actually enter Okanagan Lake. Sample location maybe should be Okanagan River? There was a miscommunication about the collection of that fish sample along the way, but we have confirmed, and corrected, the sample location to Osoyoos Lake with spawning grounds in the Okanagan River. Thanks for pointing out that there was something fishy. There is lots of detailed scientific information to be found on this site. But can you answer a simple question that the consumer wants to know: is consumption of fish (eg salmon) from the pacific (eg NE or NW pacific) safe in 2018? Yep, it’s safe to eat salmon. Our most recent results from our salmon monitoring program were posted just last month here: https://fukushimainform.ca/2017/12/18/one-salmon-found-with-fukushima-contamination-in-2016-after-extended-measurement/. 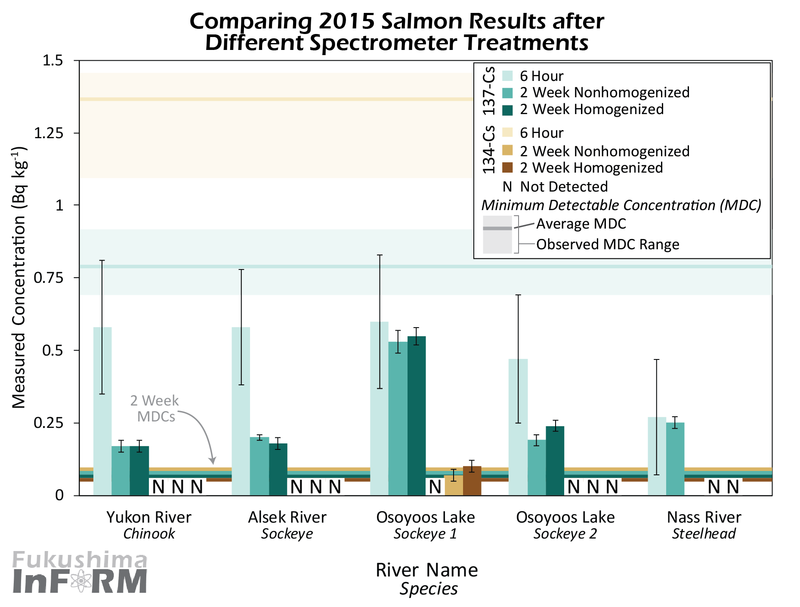 These results are from salmon sampled in 2016. We currently have ~100 samples undergoing testing from the fall 2017 salmon run and it looks like results for those tests will be available hopefully before the end of February. Happy to answer any further questions you may have!